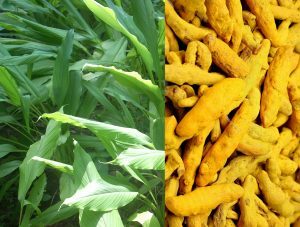 Vernacular Name : Turmeric (English); Haldi (Hindi). Description : A perennial herbaceous plant that reaches up to 1 m tall; highly branched, yellow to orange, cylindrical, aromatic rhizomes are found; leaves are alternate and arranged in two rows; divided into leaf sheath, petiole, and leaf blade; from the leaf sheaths, a false stem is formed; petiole is 50-115 cm long; simple leaf blades are usually 76-115 cm long and rarely up to 230 cm, width of 38-45 cm and are oblong to elliptic, narrowing at the tip. Distribution : Native to southern Asia; cultivated throughout the world. Phytochemistry : Rhizomes contain curcuminoids (curcumin, desmethoxycurcumin, and bisdemethoxycurcumin); volatile oil (turmerone, atlantone, and zingiberene); sugars, proteins, and resins. Uses : Rhizomes are used to treat a variety of internal disorders, such as indigestion, throat infections, common colds, or liver ailments, as well as topically to cleanse wounds or treat skin sores.